The Upper Cretaceous 'provinces' for the United Kingdom. P894997. This document is the formal statement on the stratigraphy of the Chalk Group as adopted by the British Geological Survey and ratified by the BGS Stratigraphical Framework Committee and the Stratigraphy Commission of the Geological Society. It contains a review of the nomenclature currently used in BGS publications and maps and makes proposals for a new scheme. This review draws heavily on the work of BGS staff as well as contributions from the academic community and the deliberations of a meeting on Chalk Lithostratigraphy convened at the BGS in Keyworth by the Stratigraphy Commission of the Geological Society. The document is mainly concerned with the successions outcropping in the southern and eastern part of England from Devon to Kent, in East Anglia, and in Lincolnshire and Yorkshire. 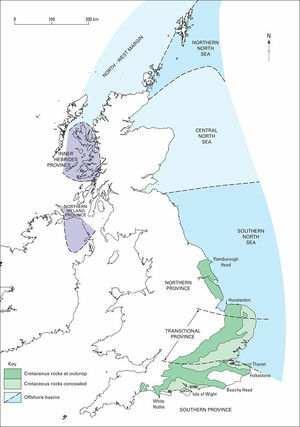 Within the English outcrop Northern and Southern provinces are well established in the literature (strictly these should be referred to, for example, as the Northern Chalk Province etc., although most of the literature omits the chalk descriptor), separated by an informal Transitional Province that includes the Chilterns and East Anglia (Figure P894997). The concept of a Transitional Province is less meaningful in the light of the proposed lithostratigraphical terminology for the Northern and Southern provinces, whose defined terms should be used wherever possible across the transition. However these provinces are a useful concept and should not be abandoned as they are defined principally on the basis of their faunal content (the biostratigraphical Boreal Realm [northern] and Tethyan Realm [southern] respectively). Other less easily defined factors such as the influence of the Anglo-Brabant Massif on sedimentological processes, physical properties of the chalk and the interdigitation of diagnostic lithologies and faunas characteristic of the Northern and Southern provinces are also a feature of the transition. Whilst the Tethyan Realm is richly fossiliferous and has an agreed international standard biostratigraphy based on planktonic foraminifera its relationship to the Boreal Realm is only tenuously correlated at many levels and further justifies the separation of the Northern and Southern provinces. Indeed the general absence of planktonic forms has led to a benthonic foraminiferal scheme being developed for the UK (Figure P894998). The limited outcrops in Scotland (Scottish Chalk Province) are also discussed and a proposal to formalise the nomenclature within the Inner Hebrides Group and based on the most modern literature is included. For Northern Ireland (Ulster Cretaceous Province), there is a well-established lithostratigraphy but it is proposed herein to raise the status of the units defined by one level thus creating the Hibernian Greensands Group and the Ulster White Limestone Group with various subgroups and formations. These two groups are effectively the mapping units since there are only limited outcrops of the Cretaceous succession at the margin of the overlying Palaeogene basalts. In both provinces lithological variation is rapid within and between basins and sub-basins as a consequence of the heavy influence of extensional tectonics associated with the opening of the Atlantic Ocean. By adopting formation as the basic unit new research will be able to define local variations at member level without the need to demonstrate lateral continuity and mappability. A brief statement of the terminologies used within the UK Offshore Sector is given in the page on that topic and is summarised in Figure P895014. 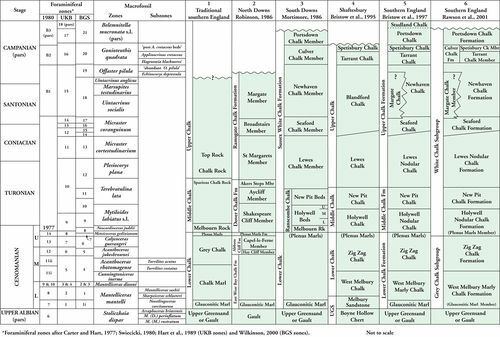 Litho- and biostratigraphical correlation chart for the Chalk group of Southern England. P894998. This page was last modified on 19 April 2016, at 10:23.